As I read this article, I wondered, how often do I engage in rich discussions with colleagues? Yes, I feel comfortable with my online PLN, and I have a handful of colleagues who don’t gawk at me when I start talking about a book or article I read. But for the most part, I avoid saying things when I am around certain people because the conversation doesn’t continue. Uncomfortable silence. That’s why I find myself avoiding it altogether. I wonder if I followed an idea like #eduread and shared an article with colleagues, something doable that’s not an entire book…to read prior to our PLC. It seems when I ask for suggestions, nothing. I don’t know if this is because they don’t want to do it, or really aren’t sure where to start. So I let it go. And that’s not effective leadership. I suppose I am paranoid, not wanting others to feel that I am judging their teaching when I suggest an article. I honestly want to talk, discuss, share ideas…so I can have better learning opportunities for my students. Anyway, how do you start rich conversations with colleagues? This was actually the 3rd task in this formative assessment lesson from MARS. It actually falls under middle school lessons, but based on student assessment data and some informal questioning in class, this is exactly what my students need in developing some foundational understanding. Round 1 was in pairs, they worked with % statements. 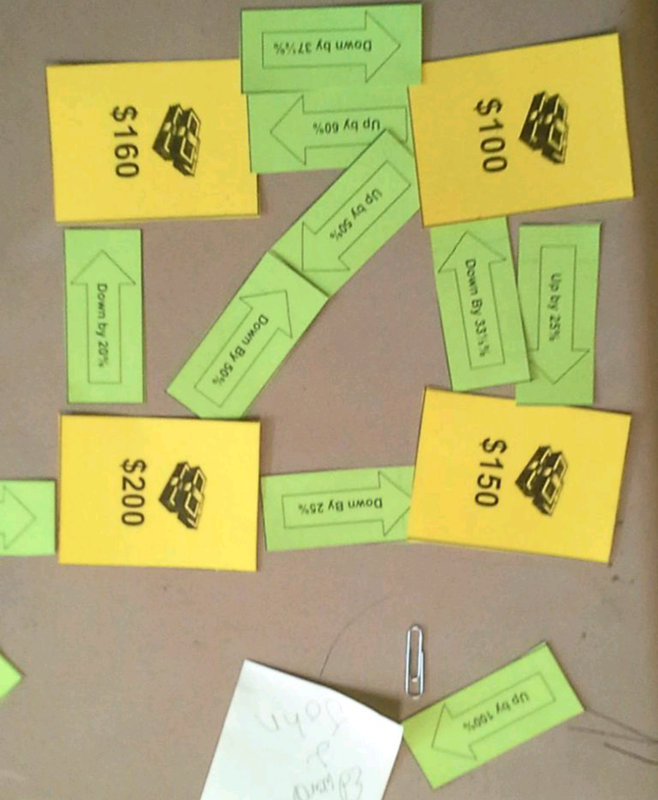 Before we began round 2, I wrote $100 and $200 on the board and asked…what can I multiply 100 by to get 200. They all laughed, ah, that’s easy Mrs. Wilson! Okay. What about changing the direction? 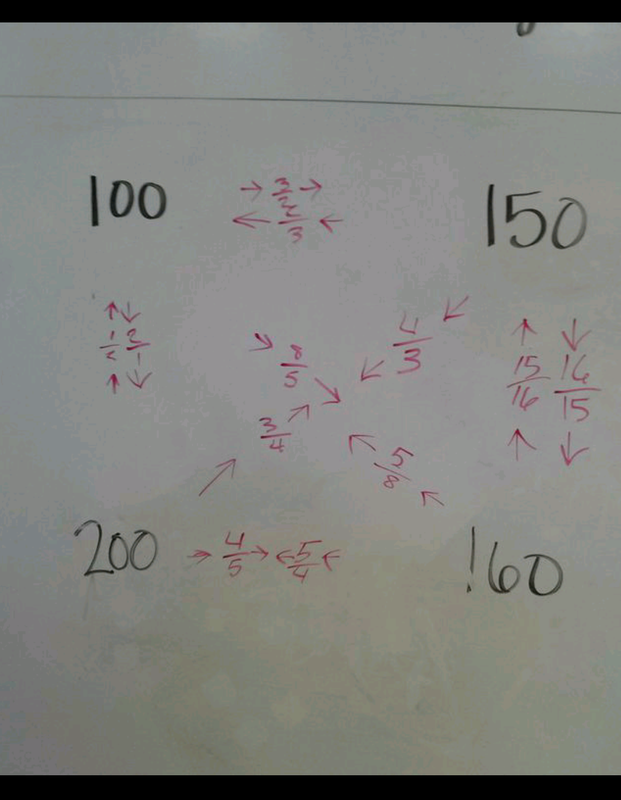 What can we multiply 200 by to get 100? No. That’s not what I asked. What can I multiply it by? What about 150 to 160? Finally. Someone showed me their answer and asked, will you accept this? It’s very close. 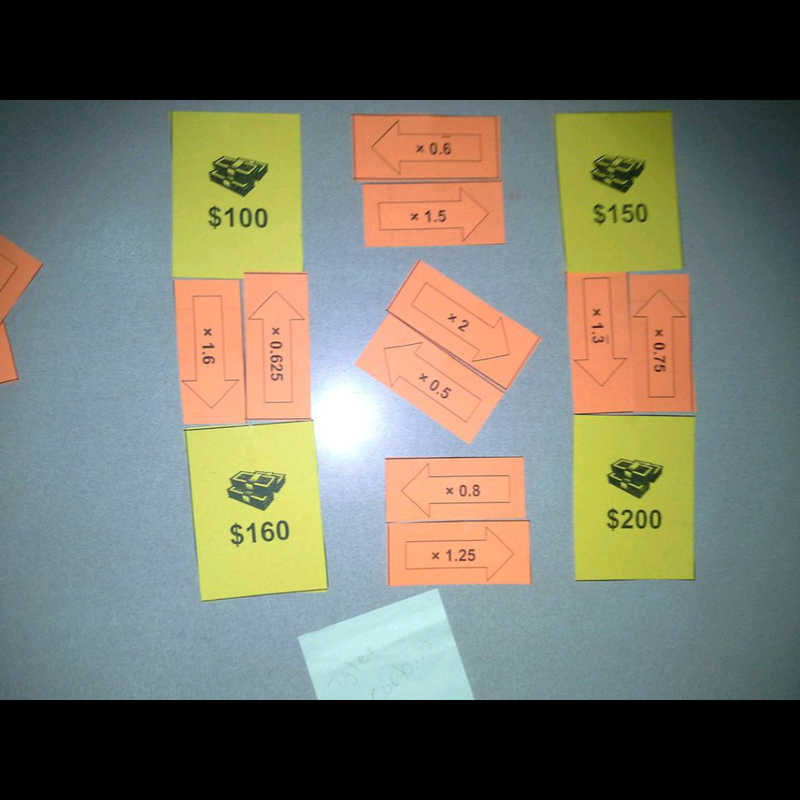 I passed out the decimal cards and they completed this task individually. Still a few mishaps that led to discussion along the way. When they returned from lunch, I had the new set of purple cards, fractions (oh my) with white boards and one marker per pair. It took them a few minutes to get settled in. You’re letting us write on the big boards? Yes! Although a couple had smaller boards in the window sills. But once they got started, it was great listening to them. They quickly began picking up on patterns. Yes, a couple of groups will be energetic whether standing or sitting but they were on task for the most part. There is still some discussions to wrap up but I am pleased with questions they asked, realizations and patterns they noticed. I look forward to referring back to this foundational understanding in the future. 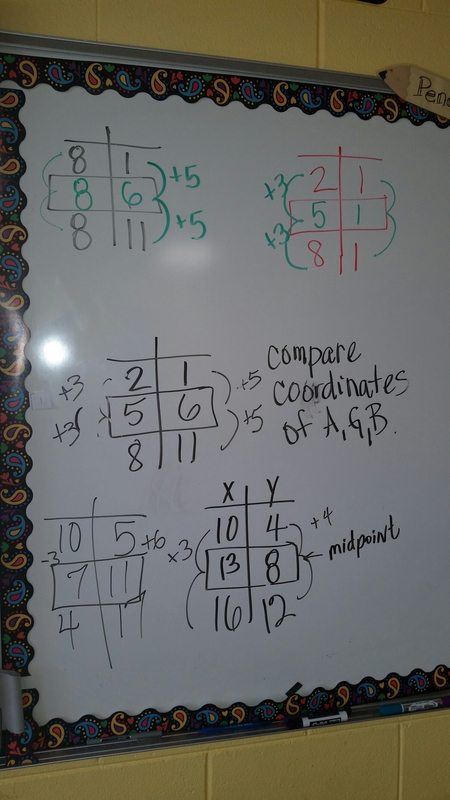 We have an Intro to Matrix Operations at the beginning of Algebra 2. Here’s my unit organizer. Targets are based on Quality Core Standards. I remember being shown this trick to use “determinants” to find area of polygons in a plane. But why does it work? Sure it’s a nice quick trick, but why? Also, we evaluate determinants and use them to find inverses…but what is the value really? What have I actually found when I do this process? Maybe I once knew. I don’t know now. But I’d like to know why because my kids will ask. And I want to do better than in the past. With renovations in full swing, our school library is currently boxed up. Our ELA folks were squirming, what would their student’s read during this time? 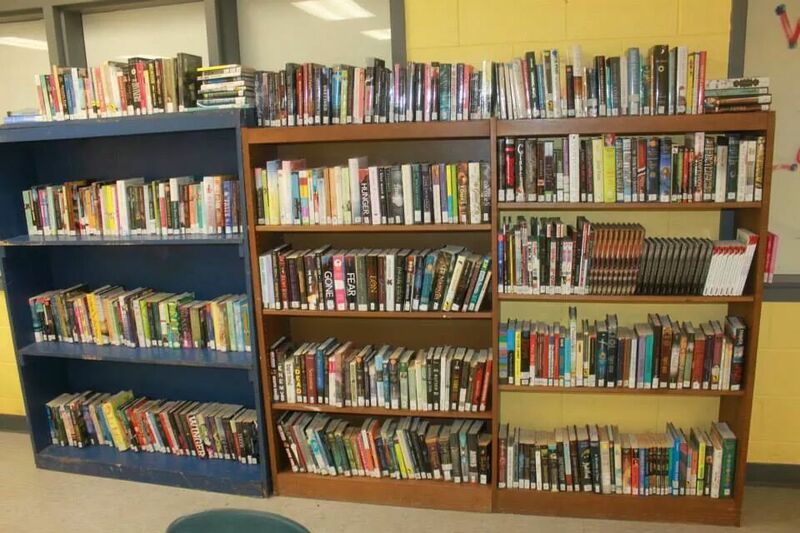 They contacted our Public Library, met with them, devised a plan…and voila! Our temporary library! The folks set up accounts for our students, complete with scan card and key tags, shared with them how to check out ebooks on their devices and provided nearly 500 books considering student levels and interests. It as begun for only a few classes this week but once all kinks are worked out, they will expand to all ELA classes. What a great community connection out ELA folks have made – even introducing the public library to some students. This is definitely a win-win for our school and community! The class that challenged me the most yesterday is the one that made me smile the most today. 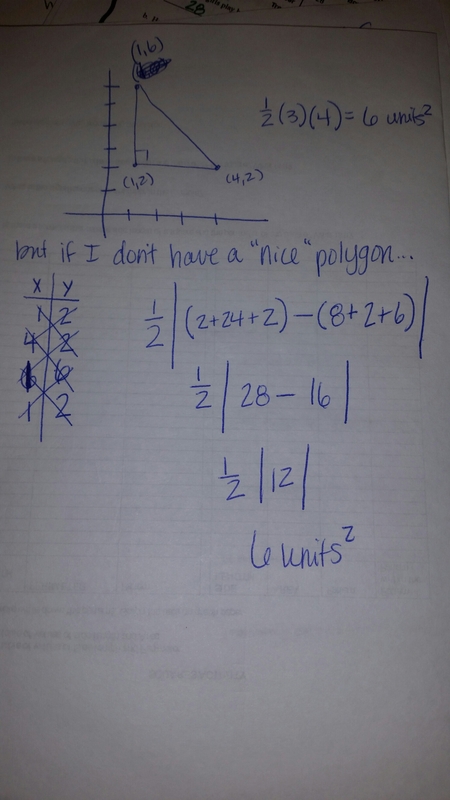 A snippet from their class…Yes I asked quest I ns, but so did they! We collected data doing “The Wave.” We talked about what we noticed. Then I asked, who would want data like this and how would they use it? Student: Maybe someone who wanted to know how long it would take all the people at a ballgame to do the wave. So we guessed how long it would take 882 students. And discussed different ways to make a prediction based on the data. They decided to calculate each trial’s rate, then average them. Another student asked, how much space would it take for everyone to line up? I don’t know. How could we figure that out? Student: Let’s see how much space we take up. 20 ft for 9 students. (Yes, that’s how small my class was today). Group 2: K got an answer of 24 feet. A: K, I disagree because if 20 feet is for 9 people, 24 isn’t much larger and that’s way too small for 882 people. So they reworked. 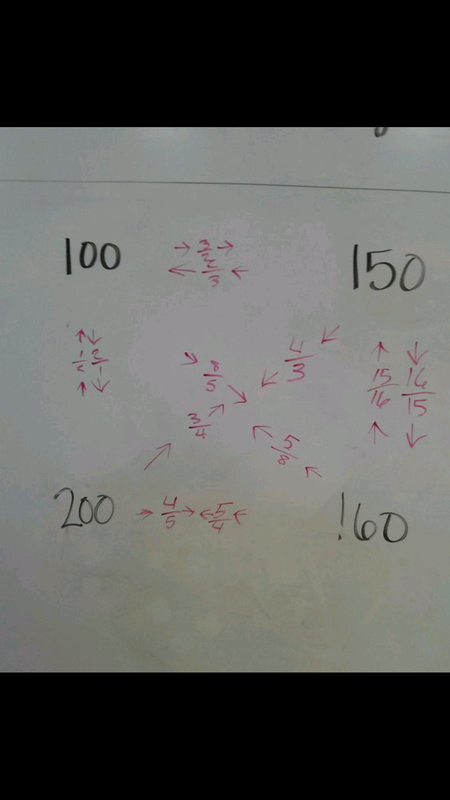 Group 3: J: I got 1960 ft. I asked the others, how’d J get this? And they explained it to me. And they shared their work. 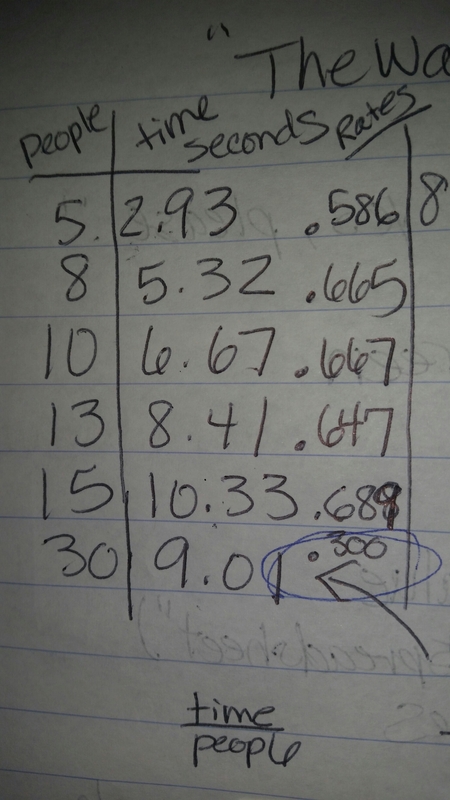 (20)(9)=180 (882)=79860 feet. S: I don’t understand where 180 came from? C: can you explain why you multiplied 20 and 9? A: what if you tried dividing those numbers and see if that works? 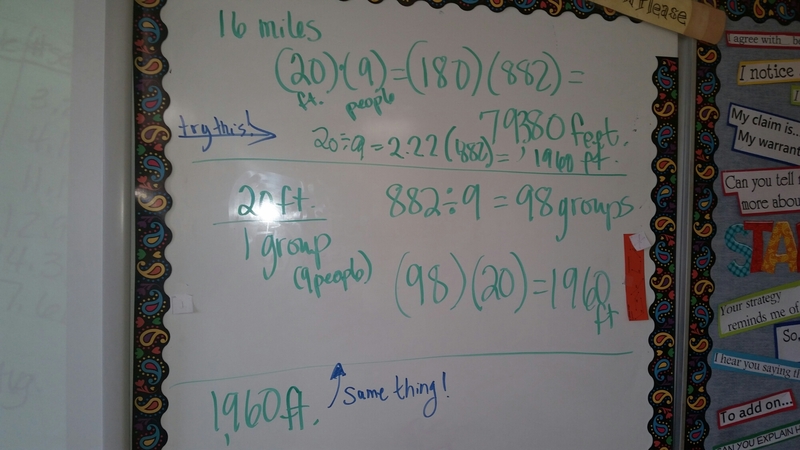 I loved how A suggested to his team that they split 882 students into groups of 9 and each group gets 20 feet. This may be too elementary for some folks reading. But the fact that a class of students who despise math, who “can’t do math” did their math just fine. They not only explained their reasoning but respectfully asked questions to critque the thinking of others. I want them to experience success. I want them to know I value their thinking. I want them to learn. I want to challenge them. I want them to smile when they enter my classroom. Yes, the class that challenged me most yesterday made me smile today. Week 2 is complete. I am still trying to find my groove with having 1st hour prep. I am a morning person, so I am ready to interact with students as soon as we arrive. Sitting down for plan time, I lose my momentum. Paired with having to be out of our building by 3:00 due to renovations, I have no time to sit and process the day’s events. I finally got my anchor chart board with sentence starters and questions completed. I am very pleased with it and have been trying to model/give students opportunities to practice in class discussions. Here is a link to a file of the starters. I giggled when I saw Sarah saying she “totally stole” from me…that’s what #MTBoS is all about. 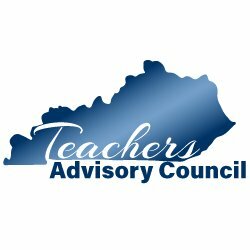 Sharing and making our classrooms better for our students! Here is the file. Print 2 up and front/back for a booklet for your INBs. 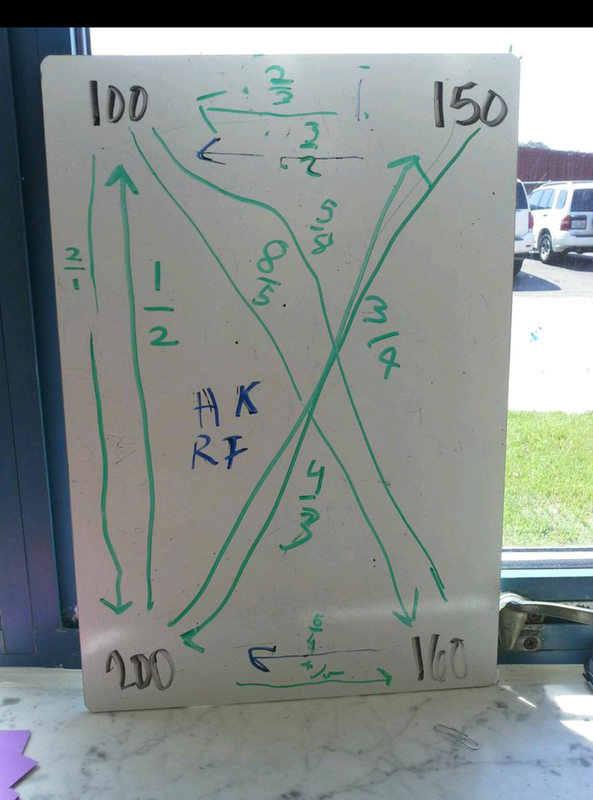 I shared Thursday how I was a bit hesitant to allow my students to go with their process of locating the midpoint given coordinates of endpoints. I know. There are those that say just tell them the midpoint formula. I could but this is the method they are owning. Basically, they are finding the distance between the coordinates, then “moving” half the distance will put them at the midpoint. Midpoint is the most common and yes, we’ll use it in proofs later. But if I go in Monday and ask them to find 1/3 point which would be a 1:2 ratio, or a 2/5, 2:3? Will their method actually prove more efficient because it is actually the same process for both? I have 3 tubs that still need to be unpacked from our renovation move. I have my shoe boxes on the shelves, but I need to get those labeled correctly. Finish an Intro to Matrices Unit, I hope will work as flipped/blended learning unit. 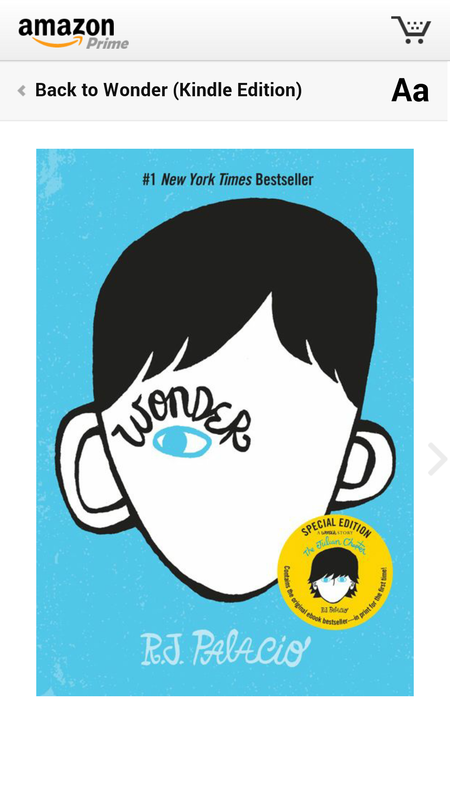 Thanks to @mathymeg07 for sharing Wonder by RJ Palacio. Megan said it is a book everyone from 9-99 should read! Right now, the Kindle version is on sale for $2.50. I am making posters of Mr. Browne’s Precepts for my classroom, such great lessons to live by. For years, I have tried to share a related article as appropriate with my classes. Often times it was a news article related to a data collection lab. However, I feel more impact for reading in math class is from informational reading with graphs/data related pieces. One day each week, I plan to use a “Laker Literacy” article (named penned by data team in school wide iniative last spring) or Stat Rat (Graph or Data related piece). 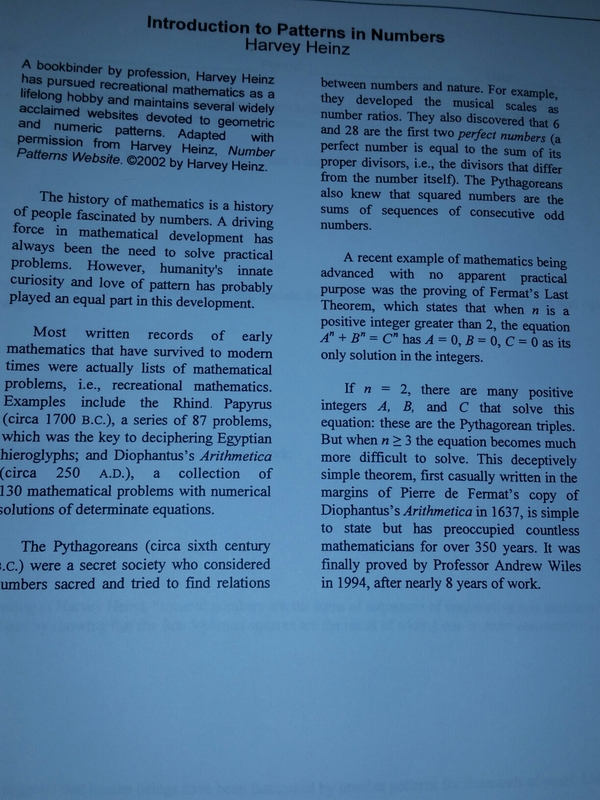 Today, my Algebra 2s read this article from a Quality Core unit on Patterns and Sequences. I asked students to number the paragraphs 1-6. After time to read, they were instructed NOT to answer the questions on the back, but rather as they read each question, make a note of which paragraph from the article could be used in helping them respond to that question. We will be using the article and questions next class. 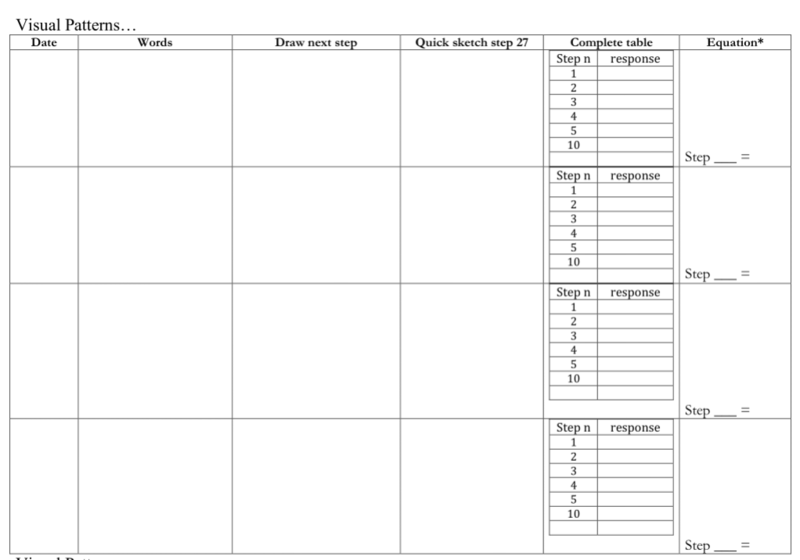 After attending @pispeak’s session on debating in math class st #TMC14 and hearing so much about @cheesemonkeysf’s Talking Points, I wanted to have an anchor chart of sorts for students to refer to, a resource to help them build their accountable talk. I pulled phrases from Pinterest boards, discussions with others and some of my go-to favorites. 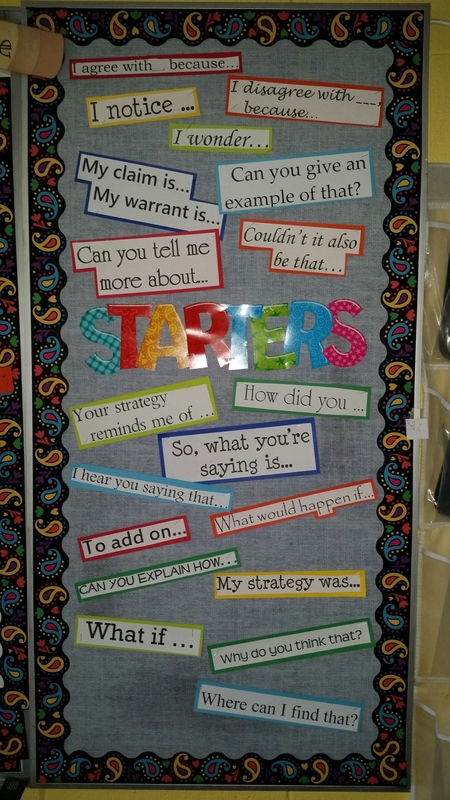 During class the first week, I modeled and encouraged students to agree, disagree, state their claim/warrant, etc. One student sat up a little straighter as she stated this “smart talk” makes me sound like I know what I’m doing. So here’s a picture of my board. I intend to add to it as the year progresses. Here is the file to accountable talk starters. You’ll need to edit for your own fonts, but it’s a starter for you. Let me know how it goes! What other phrases, sentence starters or questions would you suggest I include? During summer PD, we had leadership days focused on the 7 Habits. I am trying to make lists and prioritize my daily & weekly responsibilities. This weekend, I wondered why I didn’t try to instill this habit in my students as well. Whether they go to college, the workforce, they will still need to look ahead and plan. 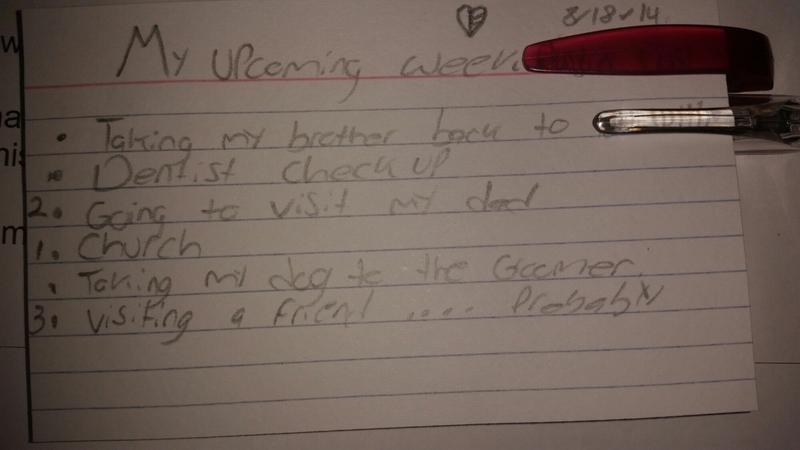 List things they have coming up this week. Prioritize 1,2,3 in their list. 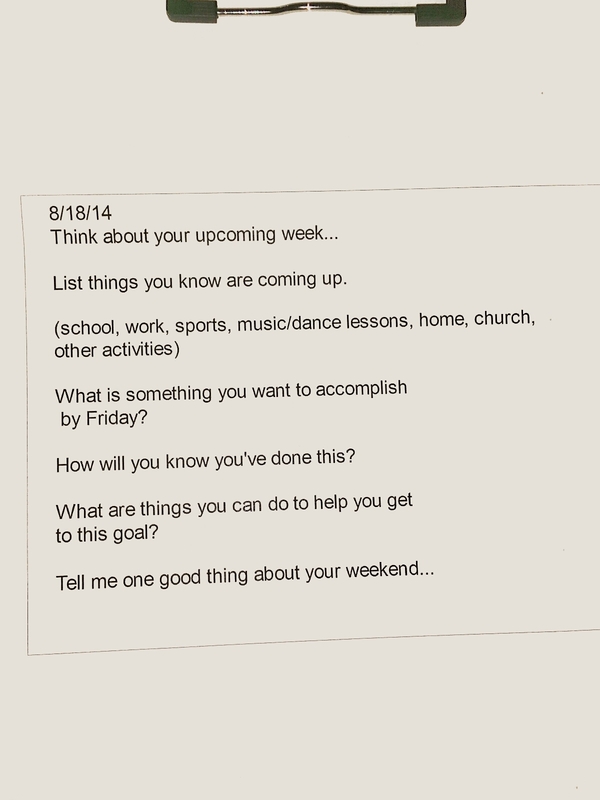 Yes, we want to begin with the end in mind, but for some students…thinking ahead to the end of the week is a stretch. Starting small and we’ll expand as the semester progresses. Yes, this took about 10 minutes of classtime, but I have gained some new perspectives for most students. Time invested in making connections. My first week kicked my patootie. I slept from 6 Friday night until 6 Saturday morning. I was nervous, anxious about starting school with all of our continued renovation but all in all it was a very smooth start to the year. Day 1 began with Notice & Wonder of Pascal’s or Sierpinski’s Triangles or some type of data collection activity in every class. I feel it sets the tone for the year. I addressed syllabus big ideas throughout the week. All classes have their INBs set up and ready to go. Several comments such as you really have thought this through, or do you really research your teaching that much? Yes. I have a plan and purpose for just about everything we will do. I downloaded a reflection packet for NCTM Practices to Standards and use it as I read throughout the semester. 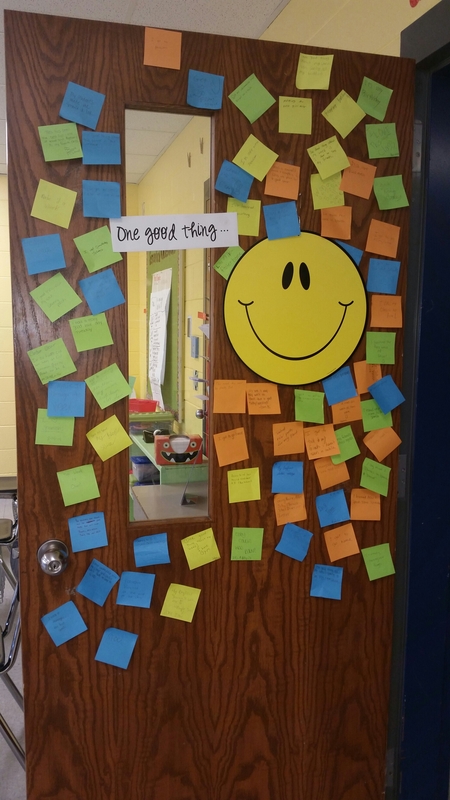 Revisit previously read books…Making Thinking Visible and Embedded Formative Assessment.